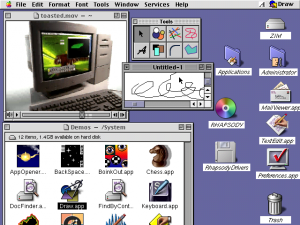 Rhapsody is the code name given to the project to port OPENSTEP/NeXTSTEP to the Macintosh PowerPC platform. The first developer releases of Rhapsody also supported x86 before being dropped prior to Rhapsody being shipped as Mac OS X Server. This page was last modified on 21 April 2019, at 19:23.